MIAMI — A former chaplain for the Miami Dolphins is accused of sexually abusing a teenage altar boy over a five-year period in the late 1970s. The allegations are detailed in a $10 million negligence lawsuit filed Thursday against the Archdiocese of Miami. The Rev. 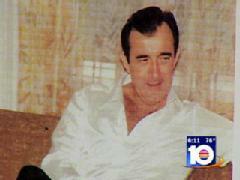 Donald Walk was also a priest at North Miami's St. James Catholic Church, Local 10's Glenna Milberg reported. The accuser, now 43 years old, is identified in the lawsuit as John Doe No. 42. In a rare move, he came forward publicly Thursday. "I've spent many years trying to forget about it. I'm just now coming to terms," said Eddy Carvin, who lives in Northwest Florida. "The church is such a big thing in my heart. You think you're doing the right thing no matter what." Carvin said he decided to come forward after learning about other lawsuits filed against priests. "Up until a few years ago, I really thought I was the only one," he said. Carvin's attorney said Walk used his position as chaplain for the Miami Dolphins to lure Carvin into a relationship. At a news conference, the attorney displayed photographs of Carvin as a teen with team celebrities like Glen Blackwood and Bob Keuchenberg. In a statement e-mailed to news organizations, the Archdiocese of Miami responded to the lawsuit by outlining its policy. "We report the allegations to the State Attorney's Office, start the process of healing and reconciliation for the alleged victim and accused, and present all the information to the Archdiocesan Review Board," the statement reads. Walk worked as a priest at St. James Catholic Church during the same years as the Rev. Anthony Mercieca, who is now implicated in the sexual abuse of former Rep. Mark Foley when Foley was a teenage altar boy. He was removed from the church shortly after Carvin's mother reported the abuse to church elders. The Archdiocese of Miami transferred him to a church in Southwest Florida, where he continued working for years. Walk is now retired and living in Venice, Fla. His phone number is unlisted. The Archdiocese of Venice, where he last worked, lists his status as a "priest without faculties," which prohibits him from serving as a priest.